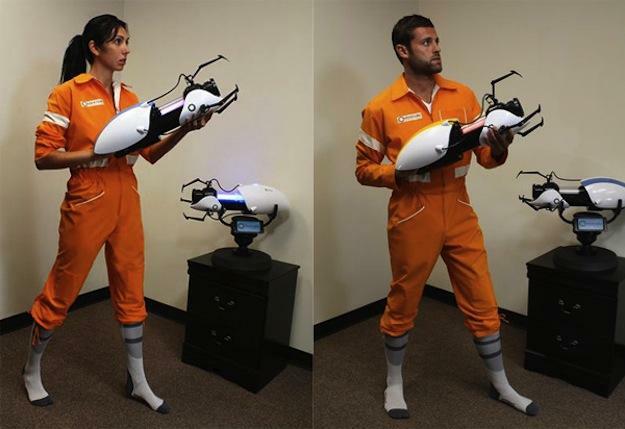 So you managed to get your hands on a life-sized replica of the Portal 2 gun or made your own. Congrats! What else to do but complete your geek obsession with an original replica of the jumpsuit Chell wears in the game? It may just be the most authentic costume you can wear this coming Halloween or other gaming conventions where cosplays are encouraged. Manufactured by National Entertainment Collectibles Association (NECA) — who, as we know, make equally amazing replicas of popular video games and movie products — the officially-licensed Chell orange jumpsuit is a simplistic outfit that comes complete with Aperture Science tags, white slabs along the sleeves and waist, and pockets just like Chell’s. Along with the jumpsuit, fans will also get a pair of socks worn by the character to replicate the look of her boots so you can be ready to do some science experiments. The canvas sleeves can also be cuffed or tied around the waist to best suit your frame, and is unisexual. Not too many people look great in a jumpsuit, but perhaps you can try to be the outstanding model. Just remember, GLaDOS will still be pretty rough on you. The official Portal 2 jumpsuit is out of stock on ThinkGeek, but e-mail the manufacturers and you may just have the costume ready for Halloween if you act fast enough. The jumpsuit retails for $100, and comes in sizes XS to XXL. You can also attempt to pre-order the item at Big Bad Toy Store for the same price, or order the socks separately if you feel like making your own suit. Watch the video of the outfit close ups below.